Laurie studied jazz at the City of Leeds College of Music and Middlesex University under Nikki Iles and Steve Berry. He also graduated with Honours in Music Design & Composition (BA) from Bournemouth Media School. 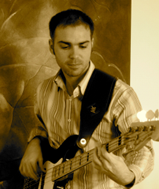 He has played bass guitar and guitar in a large variety of musical ensembles in the UK, Europe and the Middle East: from big bands to theatre shows, rock and pop gigs to acoustic trios.